Ms. Celiac Says...: Be A Health Nut! I've been living in NYC for the past 5 years, and I've visited many different markets looking to find what places sell the best gluten free products. This year, I finally discovered a gluten free gem! 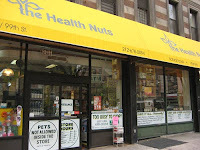 The Health Nuts is a natural food market with 3 locations in NYC. One is on the upper west side, one on the upper east side and one in midtown east. The best location for gluten free products is the location on the upper east side! They have the widest selection of gluten free products that I have seen in Manhattan. And they don't just have the usual products too, they have an assortment of gluten free products imported from Italy as well! They carry some of my favorite gluten free brands such as Joan's Gluten Free Great Bakes, Schar, Conte's Pasta, Pamela's Products, and Kinnikinnick. If you haven't been to The Health Nuts yet, I definitely recommend you go their immediately and check it out.